There have been modest shifts in overall wage inequality between 2007 and 2016. The bottom 90 percent received the same share of overall wages, 61.1 percent, in 2016 as in 2007. 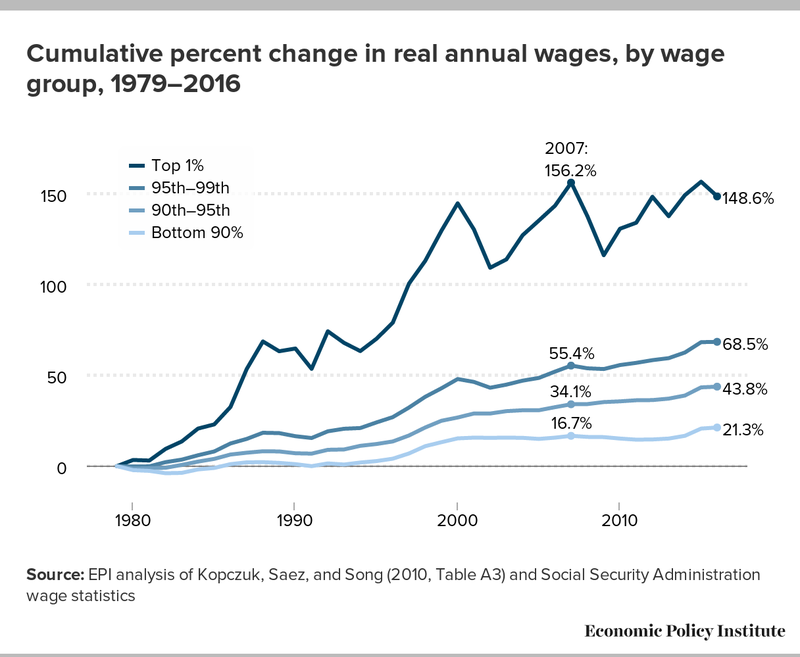 The decline in top 1 percent wages coincides with a falloff in their share of total wages, declining from 14.1 in 2007 percent to 13.1 percent in 2016 (though remaining much higher than the 7.3 percent in 1979). How do these annual wage trends align with other wage series? The hourly wage data presented by Elise Gould in The State of American Wages 2016 showed strong across-the-board growth in real hourly wages between 2015 and 2016. This is consistent with the annual wage increases for the bottom 90 percent, which can be attributed to the low levels of unemployment achieved in 2016. Overall average annual wages were stagnant, however, as discussed above: this is because of the fall in top-end wages. 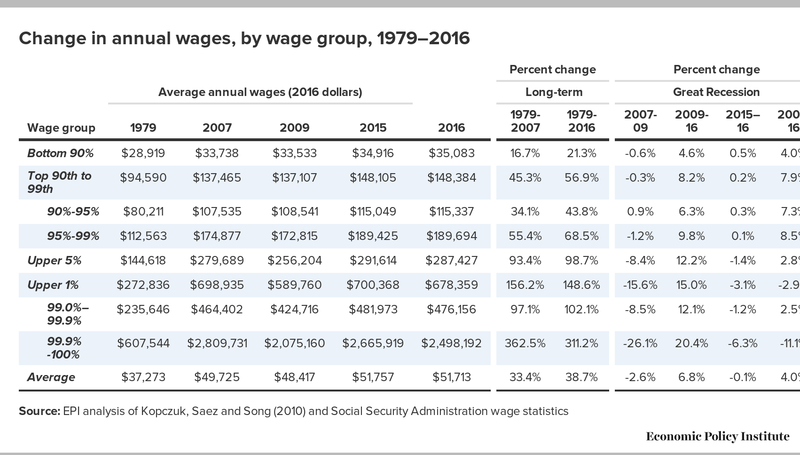 These top-end wage trends are not captured in the Gould analysis because of the limitations of the underlying data source (the Current Population Survey does not have sufficient sample size to measure wage growth for the top 1.0 percent). The fall in top-end wages can be partly explained by the 4.3 percent drop in 2016 of executive compensation (note that the drop in realized stock options get counted as W-2 wages in the SSA data used to compute the annual wage data), as reported in our latest examination of CEO pay trends. It is not yet clear what explains the fall in executive pay.